Long weekend. It was about time to go out with Olli again. By chance, via google maps, Gerardmer was chosen as the destination. We left home late and arrived in the late afternoon in a sunny Gerardmer, by the lake. You can walk the lake completely, and that was what we were going to do. Enjoyed the good weather, the walk and the views it was time to inspect the planned sleeping place. It is better now when it is still daylight, then later when it is dark and then find out that we have to find another place. A dead end road, and a place to park us among the trees. There was another walking path that led to a lookout tower. This gave a beautiful view of the valley in the Vosges. Time to eat now. We had reservations in “De Refuge”. This random choice was not too bad. A grill restaurant with a wide selection and friendly service. Satisfied with the good food, we went to our sleeping place, where it was blissfully quiet. Slept well, and after a nice breakfast, we went to the ski slope in the area to take a walk there and find some geocaches. After our picnic in the October sun, we decided to visit the city of Colmar. This city with its typical old colorful houses is definitely worth a visit. Since we still had to find a place to sleep and we were not going to find this in the immediate vicinity of Colmar, we decided to have dinner early. Here we forgot the typical French mentality regarding food. The kitchen only opens at 7 pm. If someone knows why you can’t find a restaurant that is open before 7 pm, then we would love to hear from you. Nothing to do about it. We prepare our emergency ration when we are in our sleeping place. Via google maps we found a possible sleeping place. GPS set up and on our way to Turckheim. At a 2 km from the end point, we have to take a country road towards the mountain top. Only there is an exceptional traffic sign. 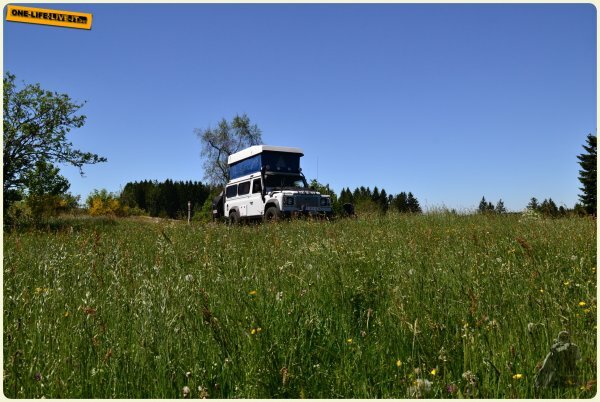 There are a lots of them in the Vosges and Alsace, which makes it almost impossible to off-road over there. No desire to look for a new place, and then again face such a sign, we decide not to see the sign and we continue driving. We found a nice place in the midst of the vines. Just heat up the Italian dish, enjoy a glass of wine and into the sleeping bag. Via the secondary roads we went home the next morning. We will certainly come to visit the Vosges and Alsace again in the spring or summer.